There has been a fuss in the last few days about people who, despite their ineligibility to vote because of their nationality, have received polling cards inviting them to vote in the EU referendum on 23 June. Just the kind of news that we did not need in the middle of a febrile and close-run campaign. The official response to this problem so far has been so confused that we have every right to suspect that the system is in a state of chaos. One simple statement demonstrates the untrustworthy nature of the electoral register: the person registering is requested to give their nationality but apparently this information is not validated in any way. The person registering can just declare themselves as British. If this statement is correct then the electoral register is clearly unfit for purpose and the EU Referendum should be called off. Fixing this shambles will take a long time. We therefore don't need to go any further, but those with time on their hands can allow themselves some harmless rage at the stupidity of the administrative mind. Here is the core of the press release the Electoral Commission issued in response to this problem. We are aware that a small number of non-eligible EU citizens had mistakenly received poll cards and, in some instances, postal votes for the EU Referendum. We are working to confirm the exact number of electors who have been affected by an issue with elections software and will be able to confirm numbers tomorrow afternoon. … if the system recording nationality is updated by someone typing in a country manually and then moving away from the screen before confirming the entry, a foreign voter was recorded as being eligible to vote. 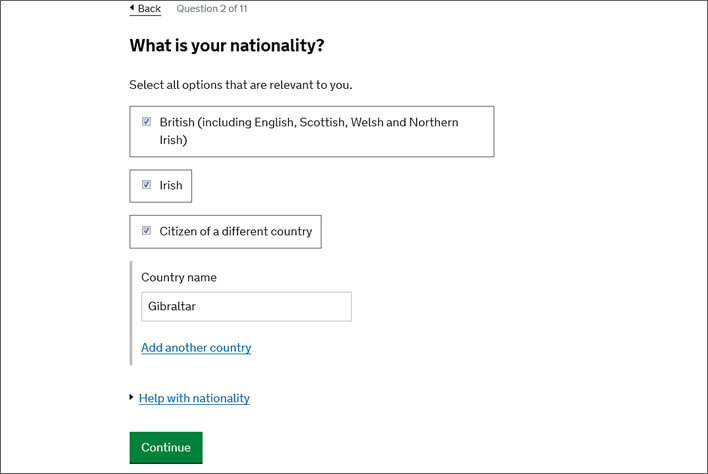 When purged of its nonsense – 'updated', 'manually' and 'moving away from the screen before confirming the entry' – we are left with the fact that the nationality field accepts a blank entry and all subsequent processing interprets a blank entry as 'British'. A blank in this data field – which really should not be permissible – is effectively the default. The web entry mask for nationality data. The web form appears to work correctly, but there is still no validation of the correctness of the nationality statement. The software provider has resolved the issue which means that, if any postal votes have been issued to these electors, they will be cancelled and none of these electors will be shown as eligible on the electoral registers to be used at polling stations on 23 June. All of the affected electors will also be written to by their local Electoral Registration Officer with an explanation of what happened and will be told that they will not be able to vote at the referendum. Apart from those few errors that have already been submitted to them, how are they going to detect this systemic error? If an additional flag has been set for 'non-British' they may be able to pick up the non-British blanks. But these may well be people who are entitled to vote. Without the country code, how on earth can they resolve this via data processing? The fix just applies to the input procedures, it seems. Note the phrase 'these electors', implying that only those non-eligible people already known to the Electoral Commission are going to be dealt with and that the fundamental problem of an inadequate database is not going to be cured. If anyone has evidence that someone who is ineligible to vote at the EU Referendum has received a poll card, they should forward the evidence to us at info@electoralcommission.org.uk. We are following up individual claims with the relevant Electoral Registration Officers to ensure that only those who are eligible are able to vote at the referendum. Our suspicion that the Electoral Commission has no idea about nationality is reinforced by this plea to turn in wrongdoers, meaning that the Electoral Commission really has no method of detecting them in their own system. Shameful. Will any of these incompetent idiots be sacked or resign? No. The Commission can today confirm that according to information it has received so far, 3,462 electors were affected by this issue. We are still waiting for confirmation from 6 local authorities about whether they were affected and, if so, the figures will be updated once we receive this information. the snafu – a threat to the integrity of the voting system – was down to its software not recognising certain inputs to its nationality field. We cast our minds back to the initial explanation, that the problem was caused by incompetents entering a value for nationality and then not submitting that data before they 'moved away' from the form, an explanation that we found puzzling at best. Now we are told, if The Register's informant is to be believed, that the nationality field used free-text entry (possibly supported by a pulldown list) and the system responded to whatever junk was typed into the field. The entry system seems to have been using a 'black list' procedure: any entry that because of an incorrect spelling wasn't on its list of countries, 'New Zeeland', say, was recorded as a British national or at least a foreigner eligible to vote. IT professionals will prick their ears up at the mention of the correct 'marker'. It is hardly believable that the designers of this system were so stupid that they recorded this information in the form of some 'franchise flag' that specifies the type of elections and referendums in which this voter is eligible to vote. Doing it this way is stupid because, if a country were to change its status – by joining or leaving the EU, for example – this would mean that the entire database would have to be rebuilt from the original input data. Anyone from, let us say, 'Outer Mongolia', a new entrant to the EU, previously excluded from voting would now be able to vote in elections where EU citizens were eligible and their 'franchise marker' would have to be changed appropriately. Which, in turn can only be done by identifying all the Outer Mongolians currently in the UK and changing their entries – an impossible task if you don't have their nationality recorded in their entry. Perhaps the nationality is stored somewhere in the electoral register record, but the structure of this record is absurd: Heaven knows how they deal with people in prison, lunatics and members of the House of Lords. If the Electoral Registration Officer determines that the elector is eligible to vote only at certain elections – for example, if they are an EU citizen – they will add the relevant franchise marker to the register to indicate this. This marker ensures that they will not be issued with a ballot paper at the referendum unless they are eligible to receive one. Does the Electoral Commission really expect us to believe that the Electoral Registration Officer, puffing calmly on his or her pipe, pores over the list adding 'franchise markers'? The franchise marker is secondary data and as such it has to be a derived value generated from the data in the electoral record, not a field in that record. As we mentioned right at the beginning of the original post, all the geeky speculation on this topic which has wasted our time but which has entertained us so far is completely pointless. The fact is that for the electoral register, nationality is self-declared and virtually never verified. This probably explains why the Electoral Commission is making noisy and offensive efforts to blame and threaten the public for its own failings. Shortly after their press release discussed in our previous update, they issued a further thunderer about the penalties for misstating nationality when registering as an elector. We repeat: none of this smoke-and-mirrors bluster fools anyone. The current problems are entirely due to Electoral Commission incompetence and extremely badly designed data storage and processing. None of the 3,462+ errors are the result of wrongdoing by applicants. The Electoral Commission is entirely to blame for this lamentable situation. The truth is that the Electoral Commission has no idea of how many of the self-declared nationalities on the entire electoral register are bogus. The main point stands unchallenged: it is possible to register to vote in the UK without any nationality check at all. The Germans, who know a thing or two about permits, have the phrase Vertrauen ist gut, Kontrolle ist besser – trust is good, checking is better. We have checked the work of the Electoral Commission and found it unfit for purpose. We no longer trust them and so we should sack the lot immediately. We read today that on Monday 6 June, two days before the deadline for citizens to be entered on the Electoral Register in order to be eligible to vote at the EU Referendum on 23 June, 226,000 registrations were received. Add to that the more than 1.35 million people who have registered in the last three weeks plus the deluge 525,000 that probably came on the last day, Tuesday. Our sympathy has to be extended to all those Electoral Registration Officers, puffing a little less calmly on their pipes, who, according to the Electoral Commission, are poring over this avalanche of data adding 'franchise markers' for nationality etc. UPDATE (9 June 2016): The Electoral Commission has now heard from all local authorities that were surveyed and they have reported that 3,502 electors were affected by this issue.